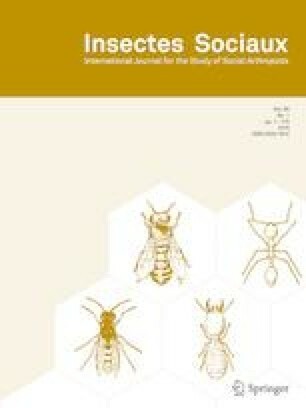 In ants, reproductive division of labour is typically associated with queen-worker dimorphism. In some species with ergatoid queens (wingless worker-like queens), this polymorphism is drastically reduced and virgin queens may integrate the worker force. While ergatoid queens have been described in several species, their colony and population genetic structure remain largely unstudied. Here, we investigated the population structure and sociogenetic organisation of the desert ant Ocymyrmex robustior. All Ocymyrmex species have only ergatoid queens that are worker-sized. Workers, queens, and males from a large population were genotyped at ten polymorphic microsatellite loci. Our results show that the study population is genetically structured, consistent with dependent colony foundation. Genetic analyses revealed that 17.6% of the males were diploid; diploid males are fertile, siring triploid females. Nests were typically headed by a single queen, and queens were strictly monandrous. However, several nests in the population shared matrilines, indicating polygyny, polydomy, dependent colony foundation, serial polygyny, or a combination of these processes. Dissections reveal that workers lay eggs in both queenright and queenless nests, while virgin ergatoid queens lay eggs in queenright nests only. However, our genetic analyses show that male offspring in queenright nests are all queen-produced, suggesting worker policing and/or trophic egg laying. The online version of this article ( https://doi.org/10.1007/s00040-019-00697-w) contains supplementary material, which is available to authorized users. We thank Quentin Willot for his help on the field and Erik T. Frank for providing us the samples used for genomic library development. We are grateful to the Ministry of Environment and Tourism of Namibia (Permit No. 2268/2017) and Gobabeb Research and Training Center for granting us collection permits. This work was supported by PhD fellowships (ASP fellowship to N.L., FRIA fellowship to A.K.) as well as several grants (S.A.) from the Belgian Fonds National pour la Recherche Scientifique (FRS-FNRS).